I have a heavy heart as I finish off this blog post today (it's been sitting in my drafts forever and a day). As Syria is once again in the midst of a warzone I cannot help but think back on happier times and how much I feel in love with this country. I am lucky enough to have travelled there at the beginning of 2009 before the terrible situation that is taking place at the moment. This part of the journey has taken me to Aleppo and Palmyra. See the first part of the journey here. Aleppo is one of the largest cities in Syria and is an ancient city, one of the longest inhabited cities in the world. 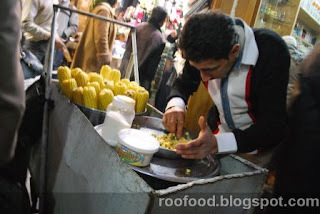 We visit Al Madana souq and we are taken around with a guide. It's alive and buzzing with trade. Trade is still conducted in a way that is hundreds of years old and I like the chaos yet simplicity of the market. Even the food carts around the market take pride in their ware/fare. 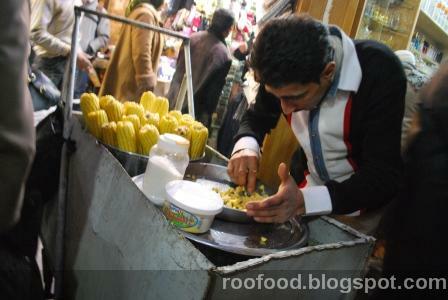 Intricately preparing cord with butter and salt and herbs, this guy takes his product seriously. Pickles are in abundance and served at every meal. 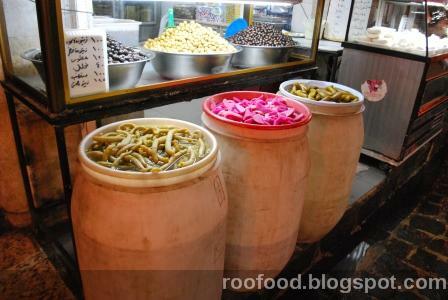 No wonder they are pickled in these huge plastic barrels! And the bakeries and sweet shops are fabulous. 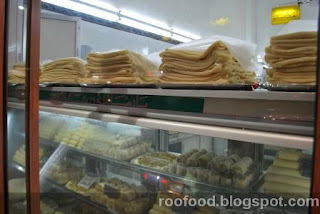 Just look at the pillows of thin, flat sheets of pastry read to sold and baked. 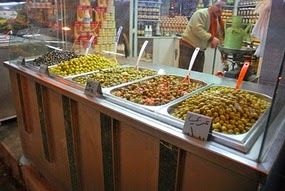 So many olives on offer too. 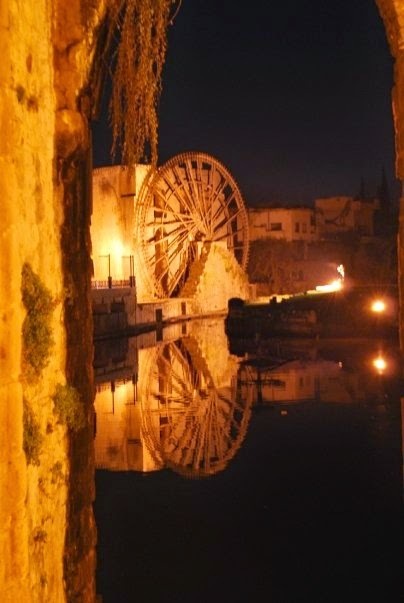 After a day exploring Crac de Chevalier, which is a crusader castle perched on top of a mountain we headed to Hama, a beautiful little town famous for their Noria’s or what we would call waterwheels. They a romantically beautiful all lit at night. Waking up the following morning we realised it was snowing and made it all that more beautiful. 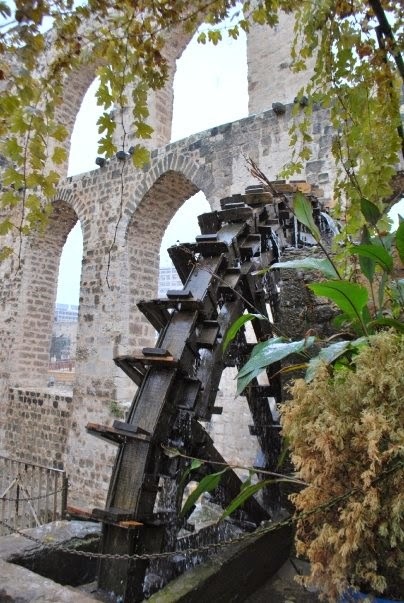 A morning wander down by the the river we stumbled across some norias working hard to churn the water under some ruins of the old city walls. We head to Palmyra for New Years Eve. This is the day it just also happened to snow in the desert. Absolutely breathtaking. 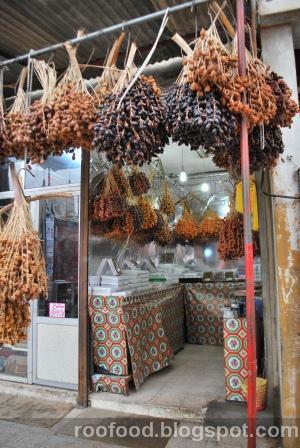 In town the main street is lined with restaurants and shops selling dates, pickles and kitchen ware. 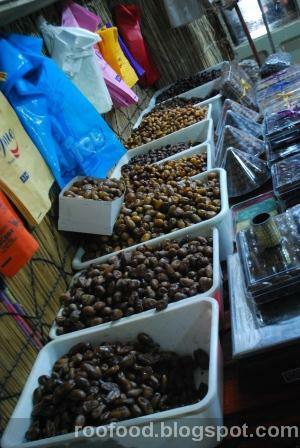 I love how this shop is drying the dates. 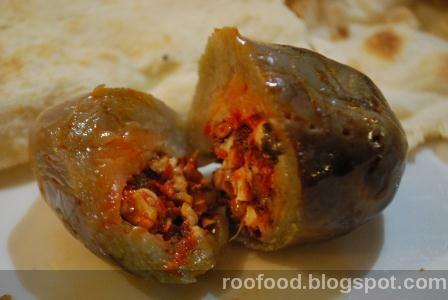 We are need of sustenance and I am eager to taste a local dish called Manaf. Springs Restaurant offered this dish and it did not disappoint. The owner Mohammed was very entertaining and his mum who is the cook in the kitchen kept popping her head out to check to see if we were enjoying our meal. 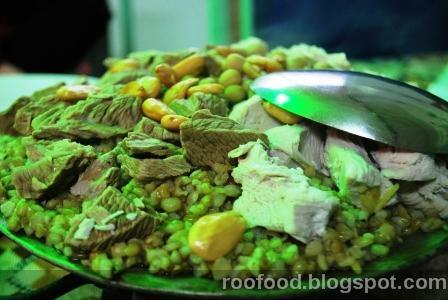 Mansaf is a bedouin dish which has meat (typically lamb) and fermented dried yogurt as a base of the dish. This particular dish had a half/half serve of both chicken and lamb with turmeric served atop freekah. Freekah is made from roasting greenwheat and is high in fibre and nutrients. 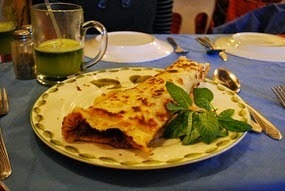 It imparts a nutty, toasty flavour and soaks up the flavourful sauce. Hearty, warming and full of love this dish and the hospitality of the restaurant is a highlight. Bellies full, we did a little shopping/exploring down the main street of town and met (another) Mohammed who was the owner of Kingdom of Dates. We had a browse inside and he offered us mint tea, dates, date honey and date syrup..
As we were chatting, the Syrian hospitality showed even more when he offered us his dinner of Mahshi, which is a dish of vegetables (typically zucchini, marrow or carrots) stuffed with mince and rice. In this case it was stuffed carrots. After declining twice being his dinner and all, he insisted that we have one. Not wanting to offend any further we devoured it. It was delicious. The carrot was soft and tender but somehow held it’s shape after cooking for so long. Being hollowed out I thought it would just mush up as you bit into it. Mohammed’s shop is cosy and we sat by the fire to warm up and enjoy his hospitality until the roof in the storage room collapsed sending boxes of dates flying and a cloud of dust and dirt circled out heads, cough cough…feeling a little helpless we helped him clean up a little.....but I knew it was time to leave when he was asking for my hand in marriage! Being New Years Eve we had plans to go out into the desert and Palmyra ruins and watch the fire works unfortunately due to the situation in Gaza, all events had been cancelled including the fireworks out at the ruins. 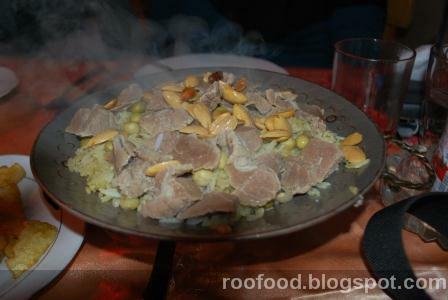 So we had dinner at the Palmyra Restaurant, sampling yet another bedouin dish of Kaway, a lamb dish baked in a terracotta pan and a few drinks and shisha on the roof of our hotel. 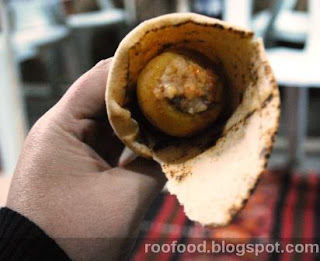 After a morning of traipsing around the Palmyra ruins in the cold crispy air we had worked up an appetite and headed to the Pancake house for a lamb pancake. 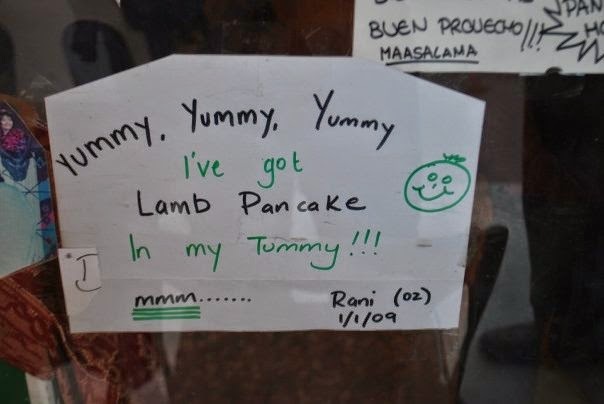 This was super tasty which somehow had had me humming ‘Yummy, yummy yummy I've got lamb pancake in my tummy"
The owner asked if I would right up a little sign to put up in his window (sort of a touristy advertising gimmick). It’s a few months later when my cousin’s tells me of a funny story of this sign in the window….when she realises it’s my sign!!!! Our last night in this great little place was spent smoking shisha, sipping mint tea and eating camel mansaf at Venus Restaurant. 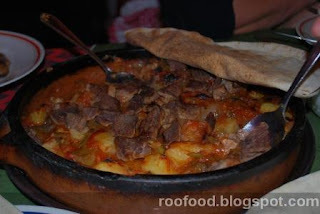 Camel is common to eat in the Gulf. It's very lean, dry and can be a little tough if overcooked. This mansaf dish was served with rice. We purchased some fun flower and bird undies, more for the novelty of it and can honestly say they are still sitting in my drawer to this day, unworn and they still 'sing'...the battery hasn't worn out yet! Our last night in Damascus we spent at the Al Khanwali House. 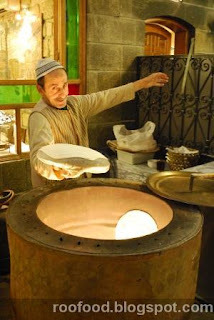 Freshly baked bread from the oven and a lovely courtyard setting. While travelling the world you come across some pretty funny translations sometimes. English can be a difficult language to learn (and being a TEFL teacher you understand the frustration students can have)....sometimes these translations are just a mix up of word placement and other times it would appear that they have looked up a thesaurus for words....and other times you get the most funniest (and often very politically incorrect) translations...as is the case with the menu here. 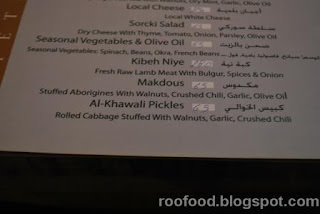 I just had to order the politically incorrect named dish - who could resist? Somehow this dish called Makdous has gotten lost in translation and in fact meant aubergines! Can you spot it? 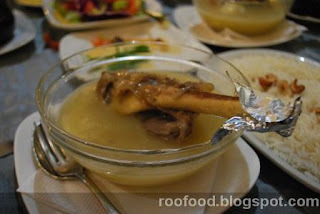 I wasn't overly hungry so I ordered a small portion of the lamb shanks with lemon sauce and a side of pilaf. When I say small it was little a tiny lamb shank - perfect! The meat literally fell off the bone as I picked it up with my fingers. The lemon sauce is tangy and acidic but well balanced and cuts through the fattiness of the lamb shank (not that it was very fatty). I am so happy that I was fortunate enough to travel here and had the opportunity to meet some amazing people. The hospitality, friendliness and absolute strength the people have is truly commendable. I went with no expectations and came away with awe and wonderment. Syria had some of the most delectable food that I had the pleasure tasting in the Middle East and still chuckle over the Makdous! All the food looks incredible. Love the sound of that stuffed carrot, and that's a fab pic of the man baking bread in the oven too!